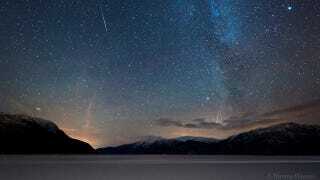 LOOK OUT BELOW | The Geminid meteor shower, photographed by Tommy Eliassen from Hemnes, Norway. See more beautiful Geminid photos here. What Does Space Travel Do to Your Mind? NASA's Resident Psychiatrist Reveals All. What Does Space Travel Do to Your Mind? NASA&apos;s Resident Psychiatrist Reveals All. Argentinians traveling Route 5 warned that they may experience "time anomalies"
What secrets does the Man of Steel trailer hold? Our Shot-by-Shot Breakdown!